FIRST IN NATION: Gov. Ige and legislators make Hawaii the first state in the nation to enact laws that align with the Paris climate agreement. Thompson’s presence sent a powerful message, as the Hōkūleʻa’s arrival was just hours away. “I will tell them the Hawai‘i they are coming home to is strong and willing to do the right thing,” he said. “The measure adopted relevant sections of the Paris agreement as state law, which gives us legal basis to continue mitigation strategies for Hawai‘i, despite the federal government’s withdrawal from the agreement,” said Sen. J. Kalani English, senate majority leader who introduced SB 559. 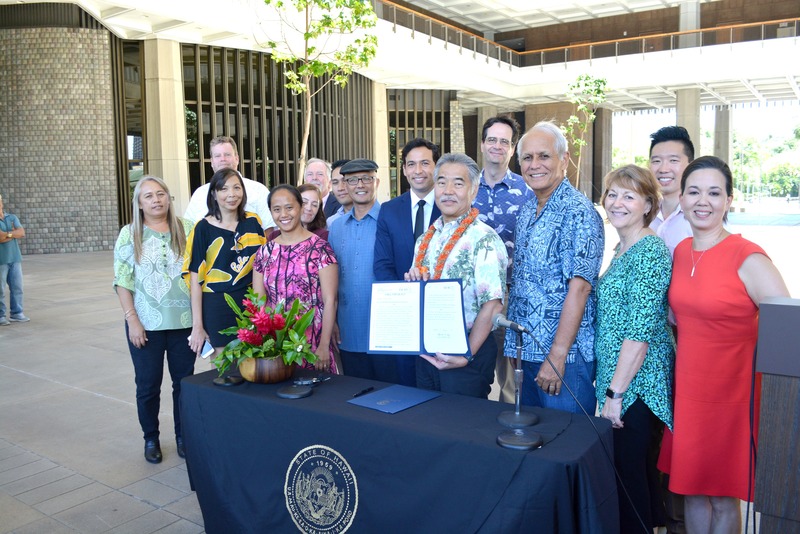 The governor signed a second bill, HB 1578, establishing a Carbon Farming Task Force, to promote sustainable practices in agriculture and aquaculture. He also committed the state to the U.S. Climate Alliance, a group of 12 states and Puerto Rico that have vowed to uphold the Paris agreement on the state level.